Our ministries provide the opportunity for more participation from parishioners in serving the Lord by serving His people. Many people are not aware of the number of ministries here who are quietly at work in the background. There are many things a person can become involved with in the parish, and many of them don’t require a lot of time. Please consider the gift that God gave you and join one of these groups. Get involved! ADORATION AND DEVOTION: A group of committed members who devote themselves to adoration every Thurs. (3:00-7:30 p.m.) and 1st Friday (24 hour Adoration beginning after the 8 a.m. Mass on the 1st Friday of each month). Click Here to sign up. 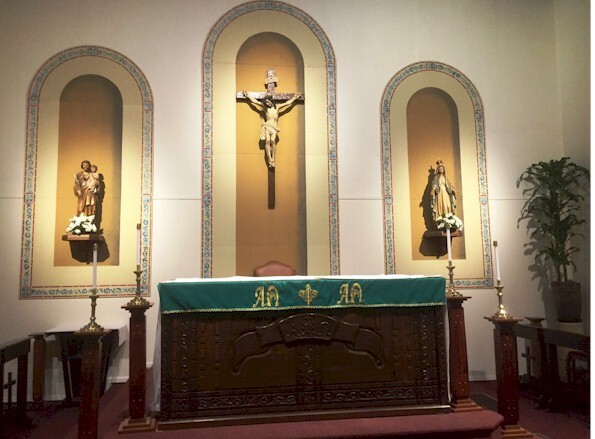 -Monthly Mass is on the first Sunday of each month at the 9:00 a.m. Mass. -Monthly meetings are the first Monday of each month at 9:45 am. ALTAR SERVERS: A group of young boys who serve at Masses (daily, weekends and Holy Days of Obligation), Funerals, Weddings, Quinceaneras, Benedictions, Stations of the Cross, etc. (following the current liturgical norms of the Church and Diocese). -Regular meetings are held the first Thursday of each month at 7:00 p.m.
BEREAVEMENT COMMITTEE: Compassionate men and women who offer their support when a parishioner has a death in their immediate family and also help coordinate funeral arrangements for the Church. EXTRAORDINARY MINISTERS OF HOLY COMMUNION: Men and wome installed to help distribute the Body and Blood of Jesus Christ at Masses (following the current liturgical norms of the Church and Diocese), and to bring Holy Communion to the sick. LECTORS: Men and women proclaiming the Word of God in the readings for daily and Sunday/Holy Day of Obligation Masses. LEGION OF MARY: Two Praesidia (Wed.-9:15 a.m. & Sun.-12:00 p.m.) with the ministry of evangelization, visitation and conversion. It consists of active and auxiliary members. LITURGICAL MUSIC: Organists, cantors (5:00 pm Saturday, 7:30 a.m. Sunday Masses), members of different choirs (9:00 a.m., 10:30 a.m., and 12:00 noon Masses) on Sunday and Holy Day of Obligation Masses, at Funerals, and Weddings. Pro-Life: Respecting life from conception to natural death. RETREATS: Sacred Heart Retreat House: silent retreats for men, women and couples. Miles Christi Retreats; spiritual exercises of St. Ignatius. ST. VINCENT DE PAUL SOCIETY: An organization of dedicated members always ready to assist the needs of the poor and the needy in the neighborhood without any discrimination. USHERS: People who help with collections, assist others to bring up the gifts (bread, wine and water), find seats for people, help keep order and security and distribute the Bulletins and Flyers of the Parish.